My most favorite of art mediums is sticker art. These are paintings on sticker labels. I've traded art stickers with other artists around the world for a number of years, with my most active trading year between 2007 and 2010. I still trade today yet not nearly as often as before; new interests have encroached on the time I devote to painting on sticker labels. On occasion I drive over to San Joaquin Wildlife Sanctuary in Irvine, California. Today was a very hot day 80's to 90. Birds aren't very active in such heat. I drove out before 9:00 AM to catch some morning activity. I enjoy listening to all the different bird sounds. Here is a Killdeer with it's bright rusty red iris. They are nervous nelly birds and complain about everything. Fun to watch. Also, a male Anna's Hummingbird with it's head feathers flared up. It's so amazing just how many teeny tiny feathers it has, and how big Hummingbird eyes are, relative to their tiny form. Since I'm a collector of sticker art, naturally I'm attracted to Shepard Fairey's artwork. This is a poster I was bestowed from a Peel Here show in Los Angeles by Sticky Rick. I have a nice small collection of Shephard Fairey sticker art that I treasure. Something has caught her attention. She become oblivious to her surroundings. She is drawn to something so beautiful. What could it be? On any given day, my desktop view may change. A vintage stapler in teal blue, blue and red velvet ribbon, a plethora of colored pencils and markers, paintbrushes, journals and other small books, candy tin, Mr. Rabbit trinket holder, paper flowers, ring dish, etc., etc. Somewhere in a field, the Red Fox watches and waits for his next meal. We all must eat to survive. Birding this weekend in black and white. 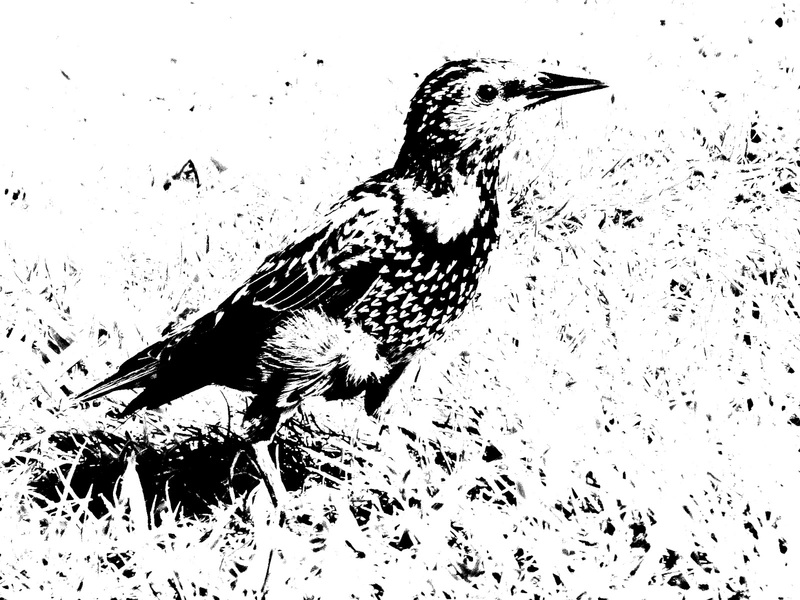 A European Starling on the grass. A Great Blue Heron wading in a pond in Irvine, California.